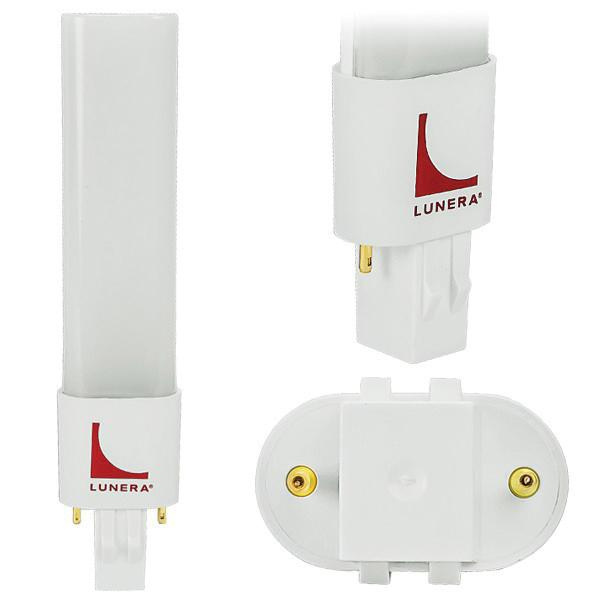 Lunera Gen3 Helen 5-Watt GX23 bulb base LED lamp in white color, offers 508-Lumens of light output. It has voltage rating of 120 - 277-Volts. This dimmable lamp featuring thermoplastic housing, has color rendering index of greater than 80. Lamp with 3000K color temperature rating radiates white light to the surrounding. This 6.01-Inch lamp has average life of 50000 hours. It measures 1.18-Inch x 0.63-Inch x 6.01-Inch. It supports both plug-and-play ballast driven installation and ballast bypass installation. It is perfect for downlights, sconces and open/fully enclosed fixtures. Lamp withstands temperature rating of -40 to 40 deg C. Lamp is UL listed and RoHS compliant.